Working with my dog Buddy has been a dream come true for a multitude of reasons. As advocates we have an excellent opportunity to communicate to the public an accurate interpretation of pit bulls and address the discrimination their guardians face every day. It allows us an opportunity to change those stigmas and perceptions. As a nurse working in the healthcare field, we make decisions centered on evidence-based practice (EBP). Some changes are actually super easy; for instance, did you know that something as simple as hand washing compliance by healthcare providers can eliminate 10 percent of all acquired infections, save 3 billion dollars and save 10,000 lives yearly! Simple changes can have a significant impact. On a day to day basis, pit bull owners are met with contempt, doubt and fabricated stories based on fear, hate and misinformation. Simple changes in the way we communicate our perspective can make considerable changes on how our dogs are received. How do we change public misconception? If there is science backing our position, nationally recognized animal organizations behind us, facts disproving myths, then how and why are we still meeting such resistance? Partly because pit bull adopters are sometimes unclear of accurate information, and we are somehow apologetic with our rationale. It can be so difficult for us not to become immediately defensive when someone insults or disparages our dogs, but we need to rise above and be smarter than our naysayers. We need to create a new culture by raising the bar and communicating more effectively by imparting simple changes. When educating the public, focus on creating an environment that negates anger, conflict, assumptions and blame; becoming defensive will only cut off the lines of communication. A positive attitude and receptive rapport will encourage an open dialogue and discourage hateful rhetoric. Don’t overreact, take a 10 second pause and perhaps say, “I’m sorry to hear that, I’d be interested in hearing why you feel that way.” This should open up an avenue for respectful communication. Presenting facts and accurate statistics from reputable, highly regarded organizations has a greater impact on the receiver than passionate opinions. 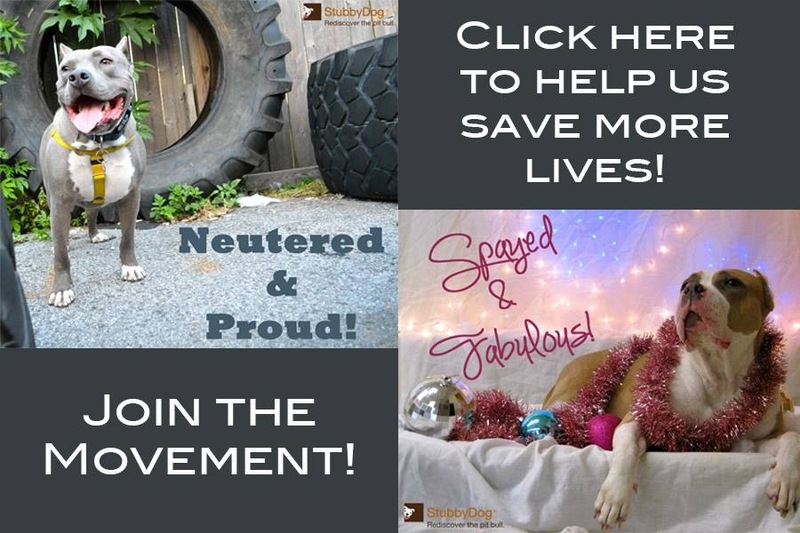 We need to encourage pit bull adopters to be role models, good communicators, be a positive influence on their community and inspire tolerant behaviors. Historically, as mentioned earlier, we have been prone to apologize for having pit bulls; I’ve even read that we are irresponsible for wanting “such dogs.” How we manage our response is critical if we want to create a new culture of positivism and pride. Studies show that to avoid conflict, we need to collaborate, communicate and be open-minded when defending our point. Defensive interactions decrease the opportunity to increase awareness. The media has demonized these dogs for decades, so trying to undo perceptions is not easy. Together we are better. Use resources like those on StubbyDog’s resource page and know where and how people can get correct information. Become very familiar with your rebuttal and anticipate your response. Behavior impacts change. For example, if my behavior is abrasive, the impact is being tuned out and ultimately not changing minds. Accountability reduces anxiety … if you are knowledgeable, clear and offer comprehensible data, you will be better received. 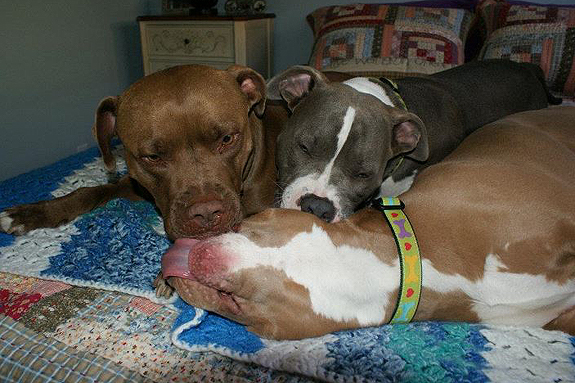 The time has come for responsible pit bull adopters to be heard. Our say is just as important as anyone else’s. 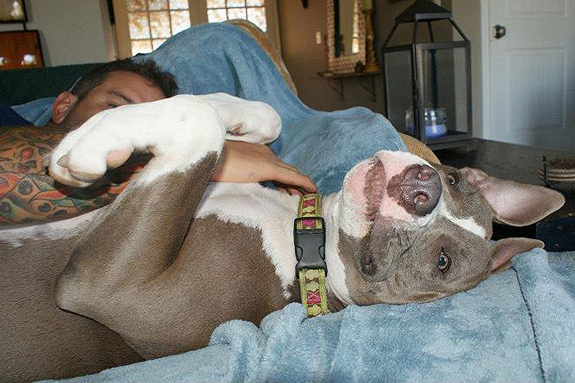 When talking about your dog or any pit bull-type dog, be enthusiastic, energetic and engaged. Encourage questions and open communication. Only 25 percent of what is heard will be remembered, and non-verbal cues are just as important; present yourself and your dog in a positive light. We all want to live in a safe environment – let’s help create that. 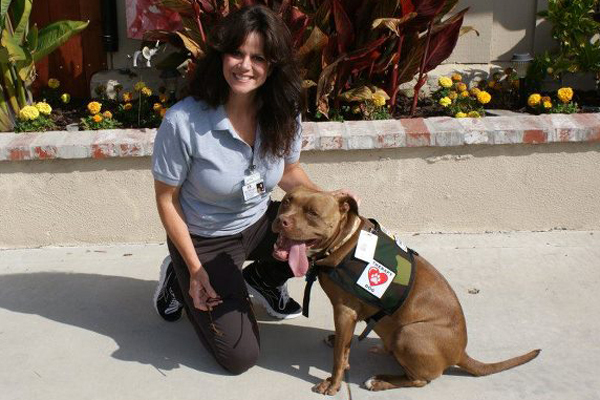 By being a competent advocate you will exceed expectations and help build the next generation of pit bull leaders. I’m a stickler for spell check but it switched owner to adopter 3 times…FYIThnx..the author of this article. We feel the exact same way! It’s all about staying positive and giving out the right message. Teaching by example speaks volumes! I agree for the most part. Experience taught me a positive interaction with a pit bull can be more powerful than facts, which is why I’m so enthusiastic and hopeful about the “Superhero Squad”. Sometimes people stubbornly hold to hype. Hate runs deep and some choose media nonsense over fact, despite our best efforts to educate. Talk, no matter how well thought out, is sometimes worthless. I learned early to get out of the way and let the dog do the work. thank you for taking part in this promising venture! I agree for the most part. Experience taught me that one positive interaction with the dog, not the the guardian, is more powerful than words. People sometimes choose hype over fact, despite our best efforts to educate. That’s why I’m so excited and hopeful about the “Superhero Squad”. Fear runs deep and in some cases talk is worthless. When someone makes a conscious choice to ignore fact, exposure to our dogs is all that will change their perceptions. Thank you for being a part of this promising venture. @Matt.S You are so right Matt, the dogs speak volumes. Thanks for your support of our amazing Superhero Squad!